The EU is to introduce a new tyre labelling system in three years' time to encourage fuel efficiency, safety and noise reduction. The new regulation was adopted by the European Parliament on Wednesday, following agreement with the EU members' governments. 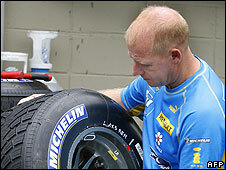 Tyre firms will have to display tyre performance data in advertisements. The use of better tyres might produce the same CO2 emissions cut as taking 1.3 million cars off EU roads. Outlining the new rules, the European Energy Commissioner, Andris Piebalgs, said "consumers and fleet managers will be able to choose safer and low-noise tyres and save on their fuel bills, while the EU as a whole will benefit from reduced road transport emissions". From 1 November 2012, the fuel efficiency, wet grip and external "rolling noise" levels of tyres will be displayed by manufacturers according to a grading system, the Commission says. The labelling system will be similar to that for household appliances in the EU. And like the European energy label, tyres will be graded from best-performance - green A class - to worst, red G class.